Jolly Babies (0-15 months) : a delightful first introduction to music – a half hour of bouncing, singing, percussion and movement where you can bond with your baby and make friends. Classes are small and carefully structured for young babies, starting gently, building to a stimulating middle section and then slowing to a calm ending. Music with Mummy (1-4 years) : this is the next step on from Jolly Babies and continues our musical journey. The main aim is to teach basic aspects of music whilst having fun. Classes are kept small which helps build confidence and familiarity. Each half term we introduce a new theme and incorporate different learning concepts such as loud and soft, fast and slow, rhythm. 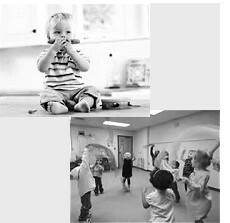 There is always percussion time and lively activities with the chance for high quality interaction. Social skills – listening, sharing and turn taking - are an important part of these classes. what are the benefits of music classes? Developmentally there is much research to support the positive benefits of introducing music from a very early age. By helping to build an appreciation of music early this can greatly assist with language development, increase confidence and strengthen the parent/child bond. Both parents and carers often say how much fun they have had in the classes and come back year after year, with future siblings too! Not only do the children have fun but as a parent or carer it is also a great way to make new friends. Classes help increase social skills, sharing and turn-taking. Classes are small and carefully structured to stimulate and encourage interaction. Each week the children engage more and more in the classes helping to develop their appreciation of music.